Bella Filtered Cigars are made with 100% American tobacco that provides a smooth and tasteful smoking experience. The blend of tobacco is specifically designed to cater to our female smokers, giving our smokers a feminine alternative to stronger filtered cigars on the market while avoiding the harsh chemicals found in other feminine brand cigarettes. 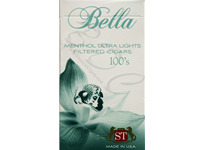 Bella is made in the USA by Sunshine Tobacco company. Bella is one of the few filtered cigar brands that come in an ultra light style for those that prefer a milder smoking experience. 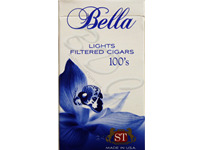 Buy Bella Filtered Cigars online today and save!